Sand dunes are such a compelling landscape to photograph. The way the light reflects off the expanse of sand and the strong shapes formed by the wind create a unique and almost mysterious setting. 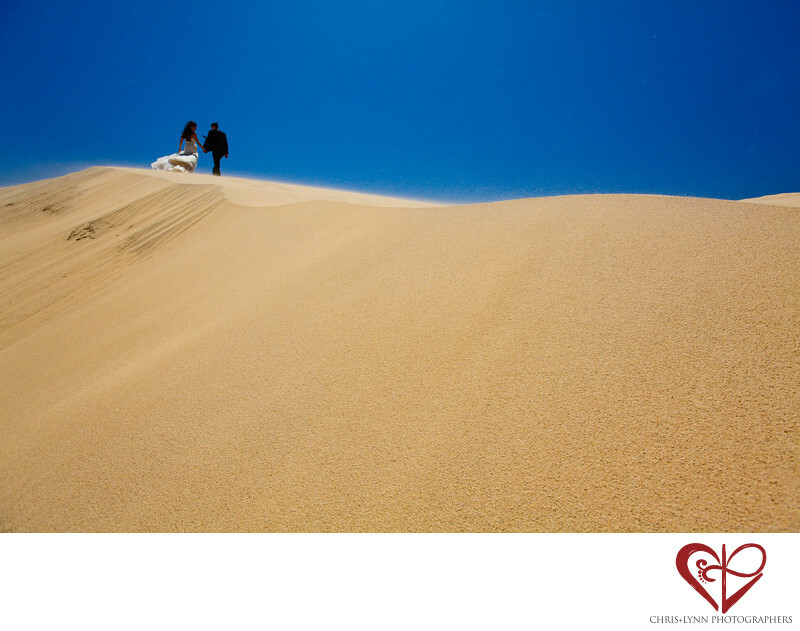 For this wedding photo, we went to the largest dune and photographed from a low angle to emphasize its grandeur. Blowing sand adds to the movement & drama of this image. The lens used was a Canon 16-35mm f2.8 zoom at the widest focal length of 16 mm. This choice exaggerates relative size, specifically the vastness of the dune in the foreground and the relatively small size of the couple. The composition, with the dune filling two thirds of the frame, also emphasized the dune's size. A polarizer filter was used on the lens to darken the sky and reduce glare from the sun - an old-school trick to make the skies more blue in camera instead of in photoshop! We asked the couple to walk in a direction that ensured no footprints would mar this expanse of sand. They had a blast exploring the dunes and said they felt like they were on the top of the world! 1/800; f/8.0; ISO 400; 16.0 mm.